CookinFanatic | "One cannot think well, love well, sleep well, if one has not dined well." The New and Improved CookinFanatic! 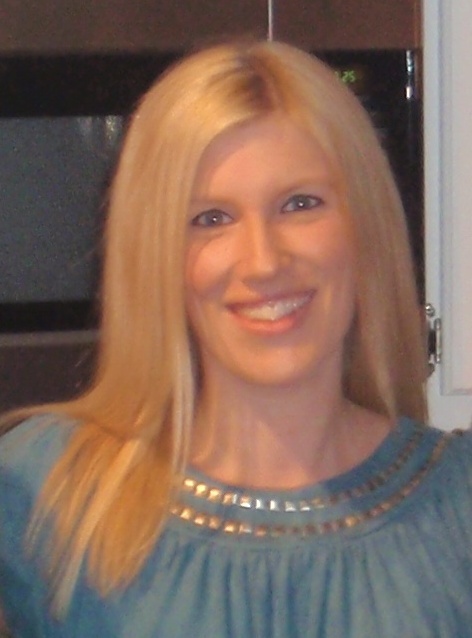 Just wanted to remind all you friends to check out CookinFanatic at its new site!!!!! CookinFanatic even got a new look for the new year… and is now on facebook! Oh, and don’t forget to update your google readers too! Check me out at the new site from here on out!!! You won’t want to miss this one guys! The Man ate the whole bowl WITHOUT any added cheese it was THAT good (this is unheard of by the way, he’s the pasta + cheese king haha). Peaaanut, peaaanut butter. And chicken? Monday’s word of the day was T-I-R-E-D! After a post-Super Bowl bedtime of wayyyy too late o’clock followed up with the random early body-clock-alarm-wakeup I was seriously struggling for energy yesterday! Gave me plenty of time to relax and get in a rejuvenating yoga session. Has anyone else tried the Body by Bethanny yoga workout on ExTV? I absolutely love her first of all, plus am really liking this workout on days where I want some physical activity but not too much, ya know? After yoga was over it was time to serve up some dinner. 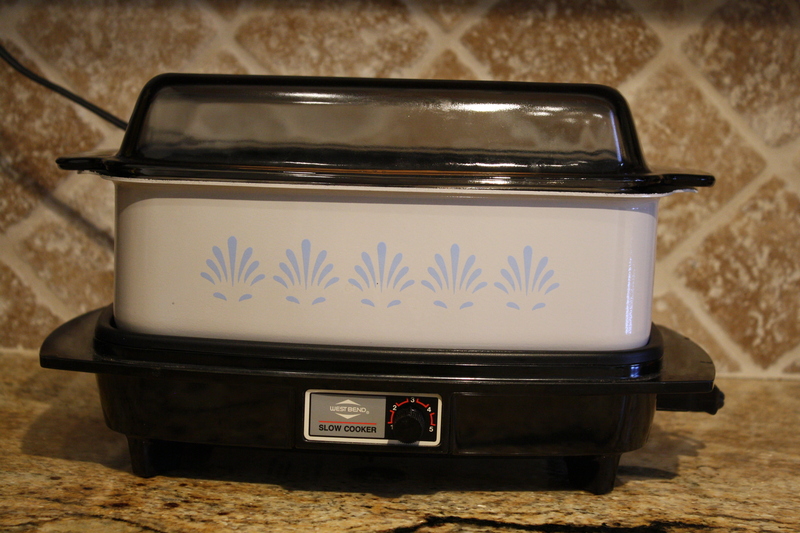 Crockpot, sometimes I think we may be soulmates… you make my life so easy on days that just seem to be so hard! Here’s the recipe, courtesy a A Year of Slow Cooking. 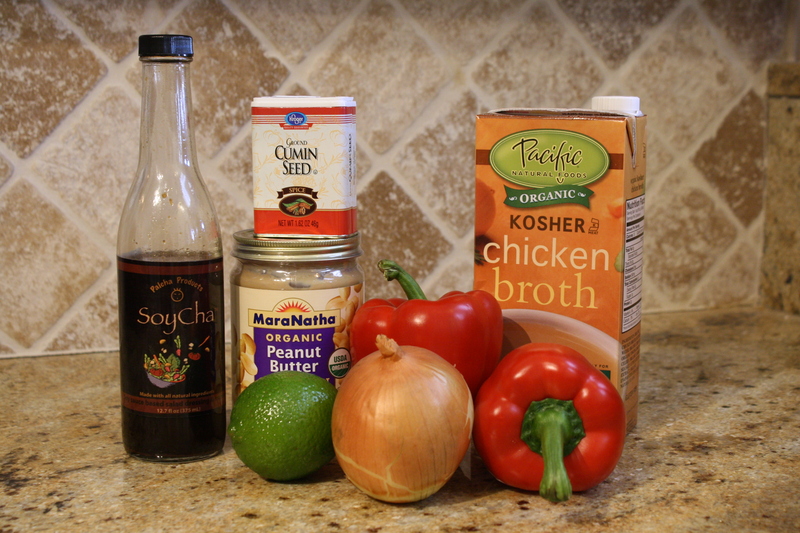 I also didn’t have any soy sauce on hand, so substituted this wonderful SoyCha sauce instead. I mixed up the marinade (sans chicken broth) Sunday afternoon before we left for the Super Bowl festivities. I also chopped up the red bell peppers and onions so they’d be ready to roll in the morning. After 9 hours on low, I came home to some pretty awesome kitchen smells! 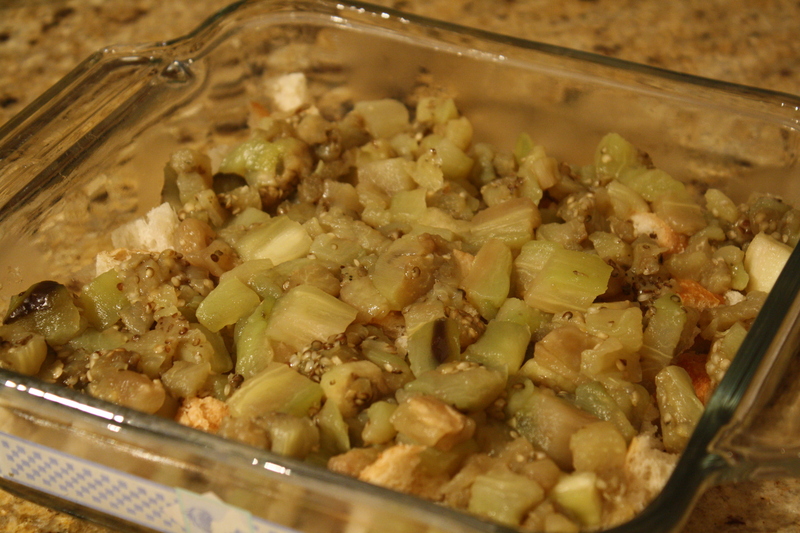 Once I opened up the slow cooker I removed the chicken & veggies and drained most of the fat from the remaining sauce. 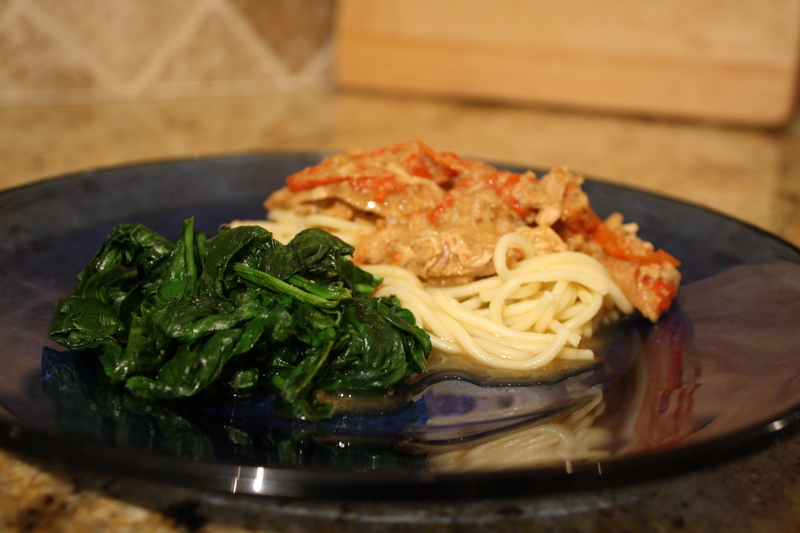 To serve, I cooked up some spaghetti to serve as well as some simple spinach. Very very rich dish. A little goes a long way! But also very flavorful and tasty. 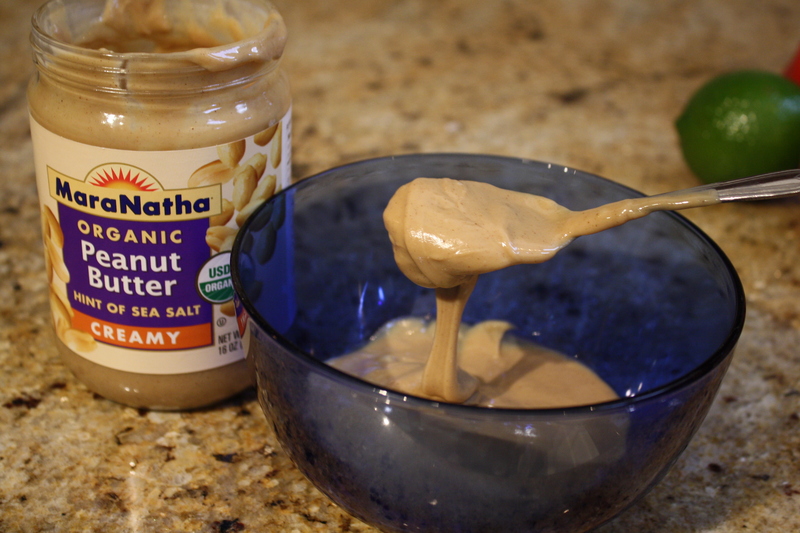 The cumin and lime added a different spin to the “normal” peanut sauce that I’m used to – but in a good way! 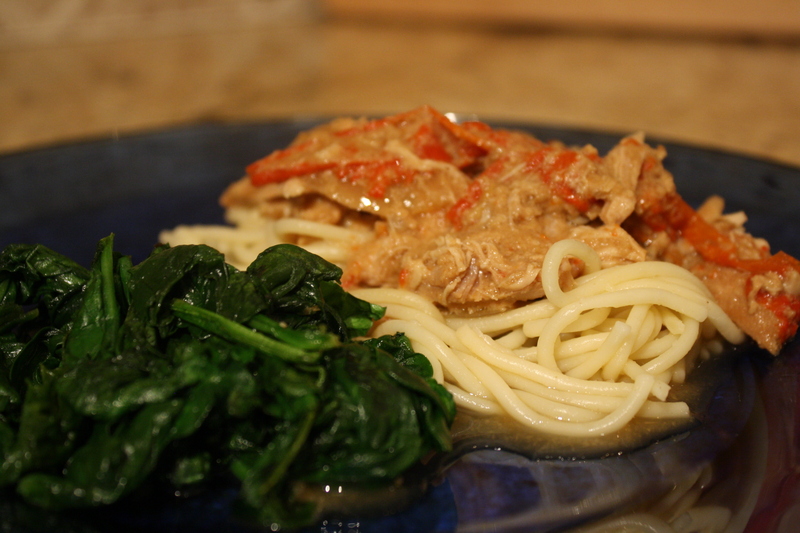 The chicken was also fall apart tender and just sunk itself into the spaghetti with each bite. Does anyone else remember this song (in reference to the post title)? Guess having a sister 7 years younger means I remember wayyyyy more Barney than any normal person should hahaha. Here’s to a much more “awake” day today – thank you 8 hours of sleep!!!! Still can’t believe they won 🙂 And what an exciting game it was!?!? We watched the game with a few friends over at The Man’s parent’s house. Everyone brought some food for game-time muching, here were my contributions. 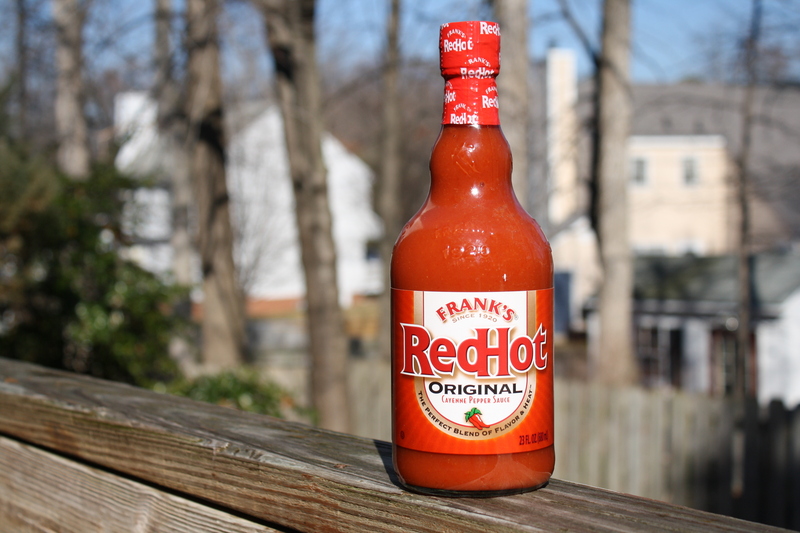 Frank’s hot sauce was the theme! After seeing these beauties on Andrea’s site just a few days ago, I knew I couldn’t resist much longer. And how perfect are they to bring to a football party?! After marinating 2 chicken breasts in Frank’s hot sauce, I pulled out Nanny’s old little slow cooker/warmer thing (not your conventional crockpot) and let these cook. Seriously, you could have never set foot in a kitchen and this thing will produce 100% no fail results with chicken every. single. time. 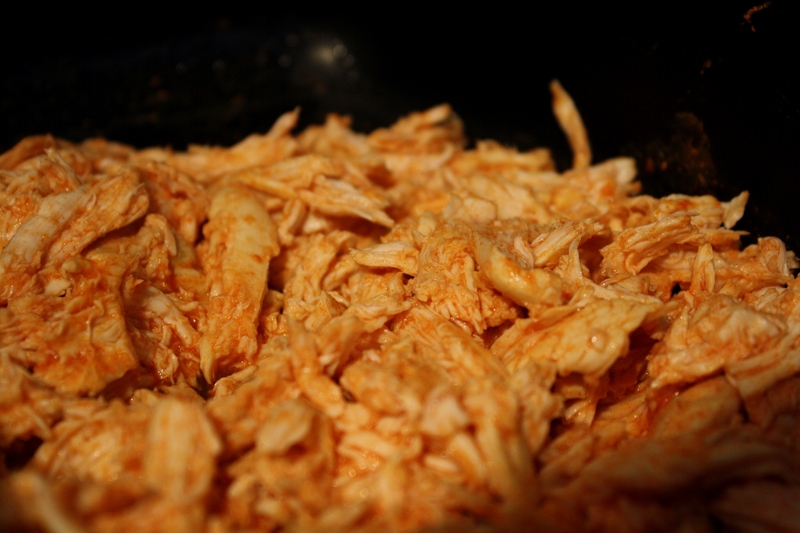 Level 3 for 30 minutes and voila, moist and flavorful and ready for shredding. After I shredded them up I added some more Frank’s and let the chicken stay in the warm slow cooker for another 30 minutes or so. 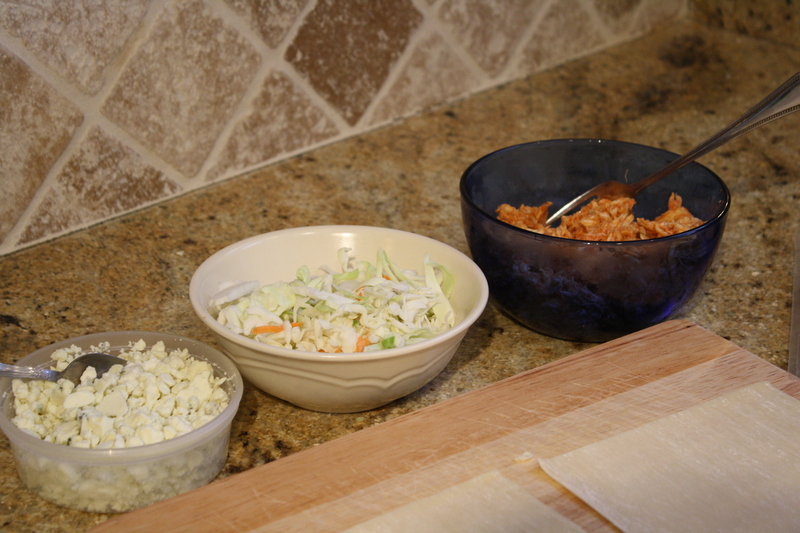 Nasoya egg roll wraps, cole slaw mix, shredded hot sauce chicken and bleu cheese crumbles. How can you go wrong here? Just like Andrea, I did a layer of cole slaw mix, a layer of shredded chicken topped off with a layer of crumbled bleu cheese. A little dab of water sealed the deal and these were off into the oven. 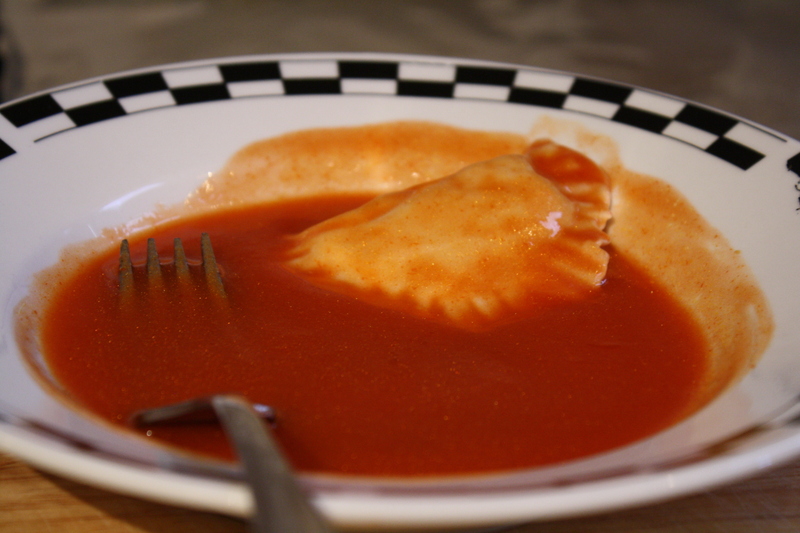 To keep with the Frank’s hot sauce fiesta as well as use some of the 100,043 pierogi that we made during the holidays & stashed away in the freezer, I found this great idea online! 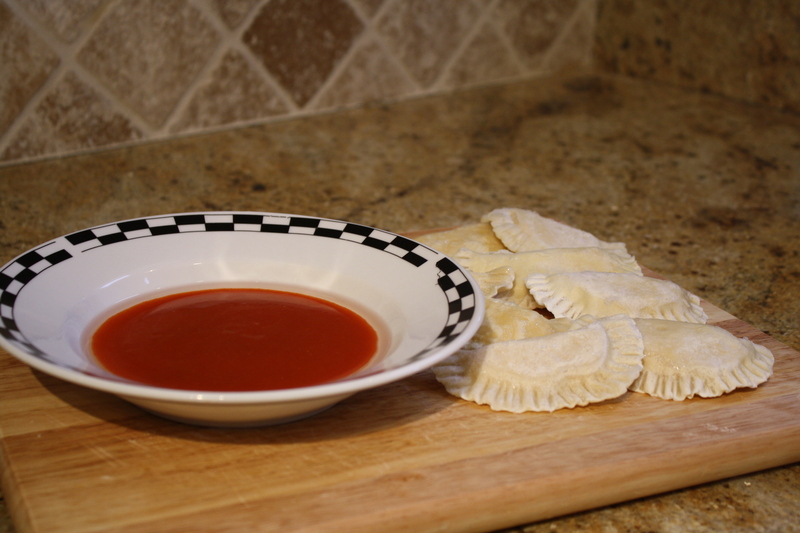 Simply mix together a bit of veg oil (1 tblsp) with some Frank’s hot sauce (1/2 cup), stir, then dip pierogi one by one to cover. 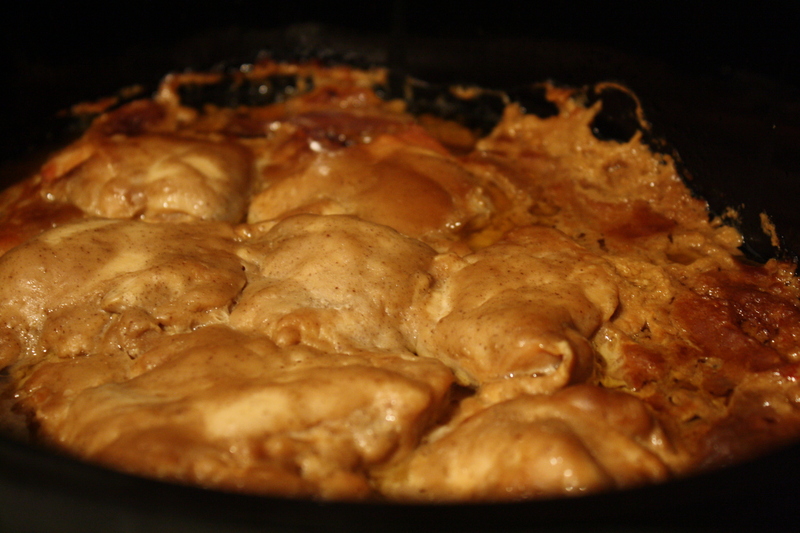 Layer on a baking sheet and cook for 20 minutes at 400F, flipping once or twice. 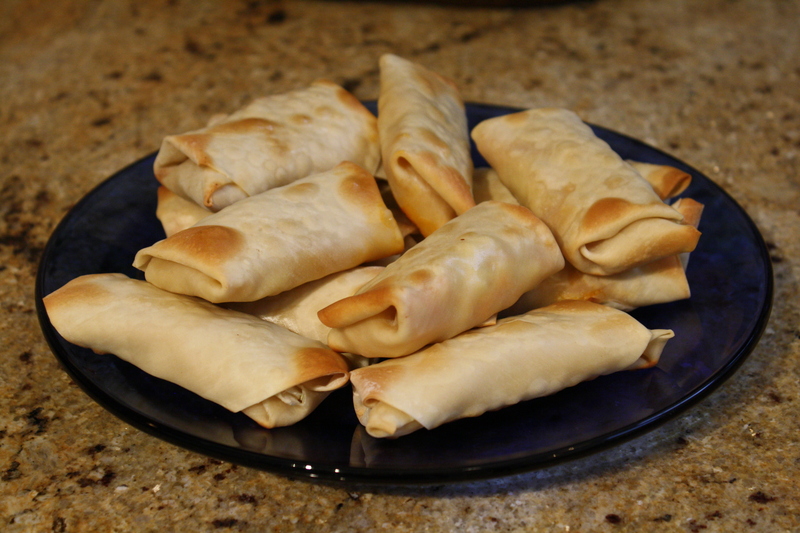 They puff up and get all crispy-like, glorious! 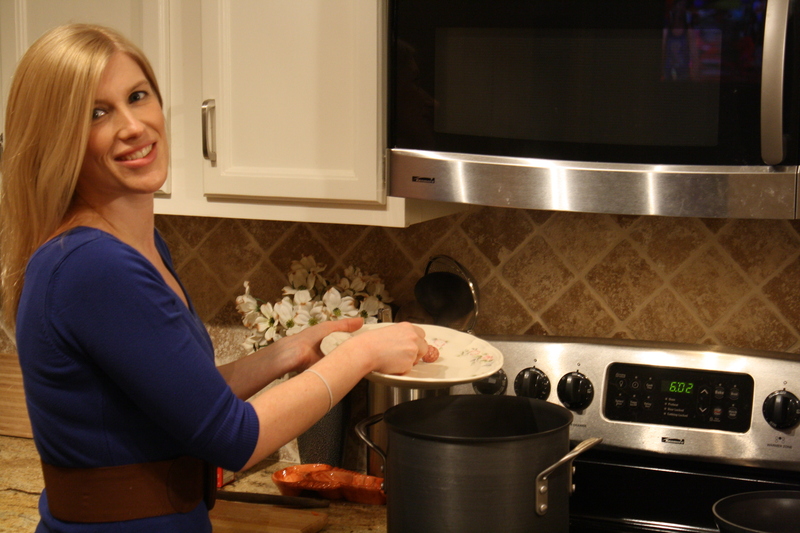 I must say that both of these dishes were a huge hit with me and the rest of the party too! 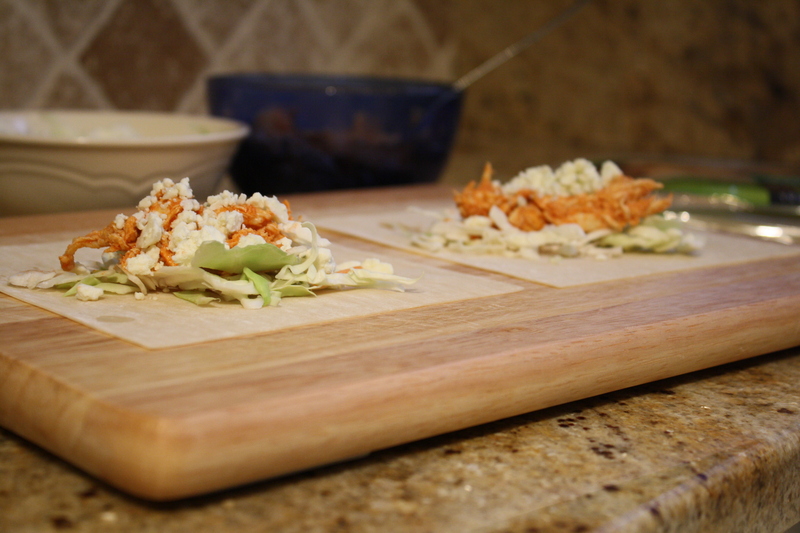 The buffalo chicken rolls were perfectly crisp and the chicken filling with the warm, melted bleu cheese was so delicious paired with a cool, creamy dip into some bleu cheese dressing. 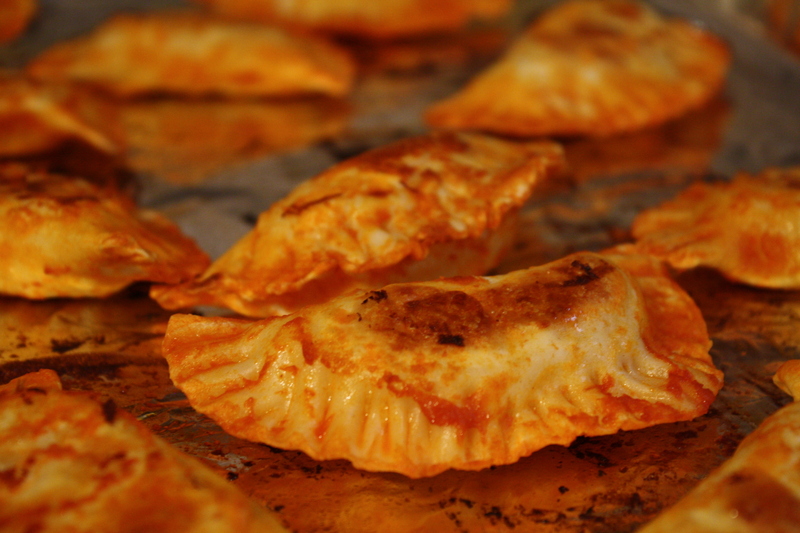 The pierogi really took on the spiciness of the hot sauce which was mouth-watering combined with the cheesy, onion mashed potato filling. Oh yea, and only 7 more days from today until the big secret reveal!!!!!!!!!!!!!!! I feel like a kid before Christmas. 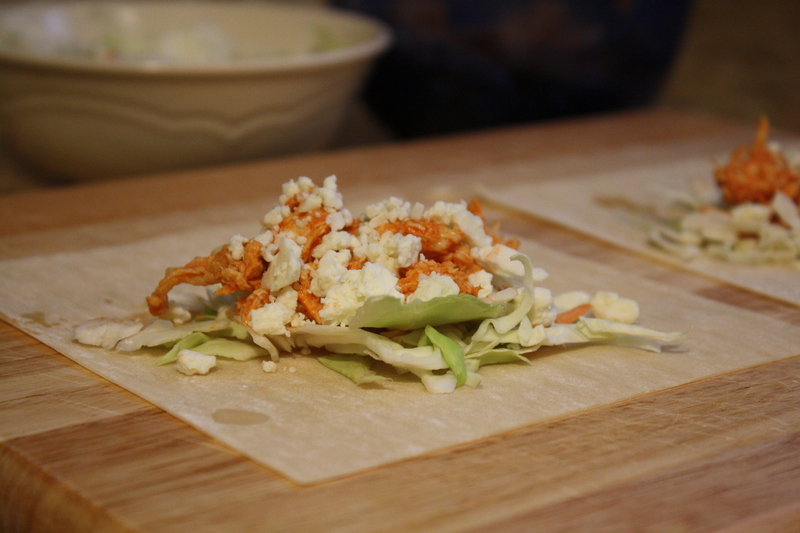 I’m trying out two fun recipes for the game festivities —-> here’s a sneak peak. Now let’s just cross our fingers that The Packers pull through or else not even this delicious food is going to make for a very happy boyfriend hahaha. 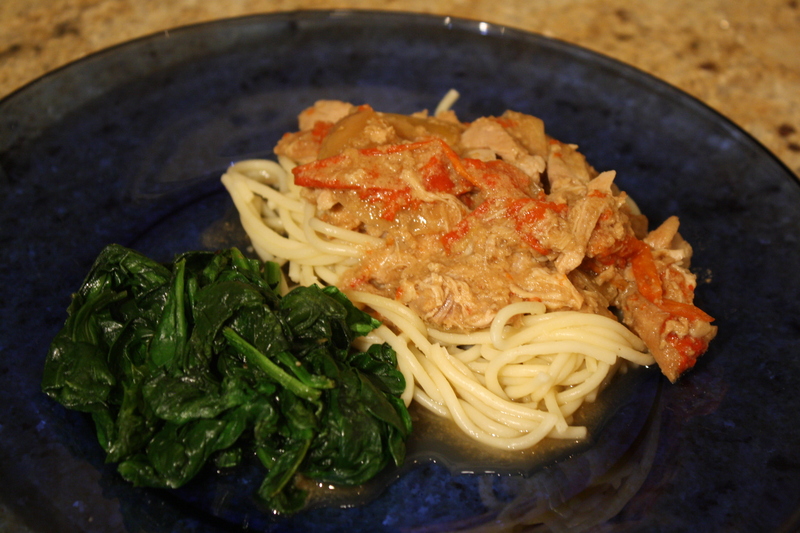 What I didn’t reschedule was the actual dinner itself, and I’m so glad I didn’t because this new to me recipe was well worth the less than an hour of effort! 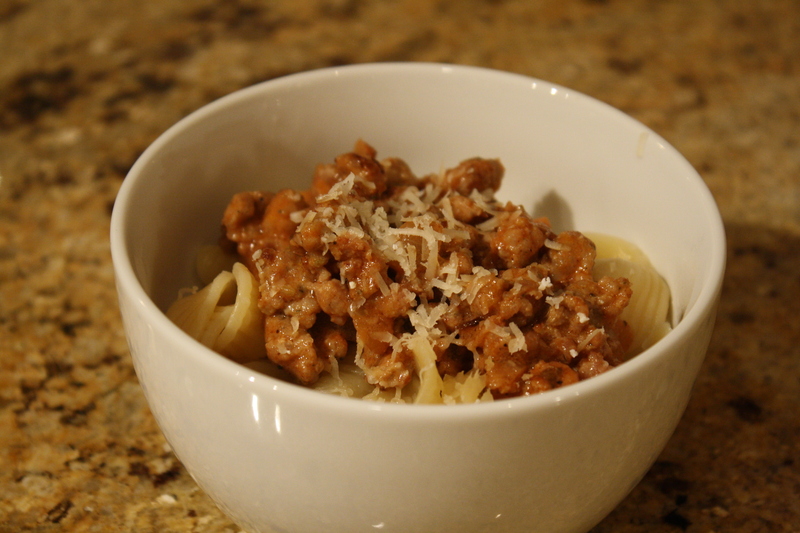 But back to dinner, which like I said was a new-to-me recipe. I followed this recipe, making a few modifications as noted below. Recipe courtesy of Cinnamon Spice & Everything Nice. 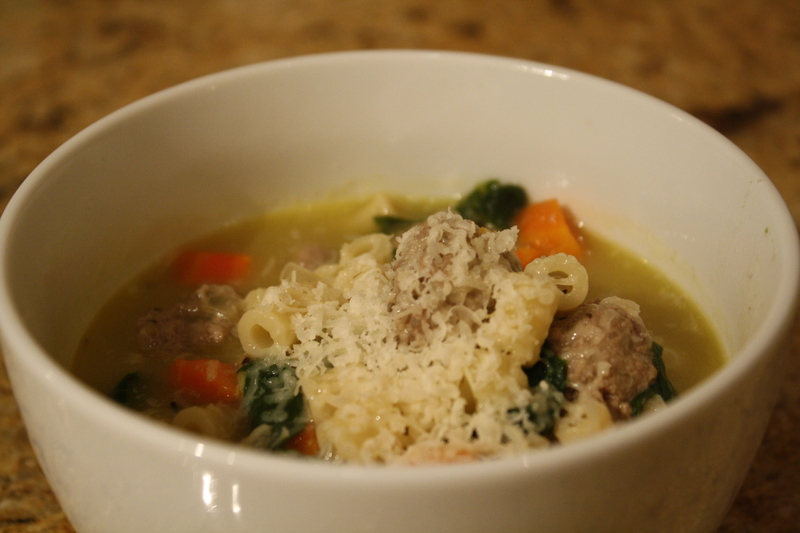 Main changes were using more pasta than called for (we like less broth), panko for bread crumb and dried oregano and basil in place of the seasonings noted. 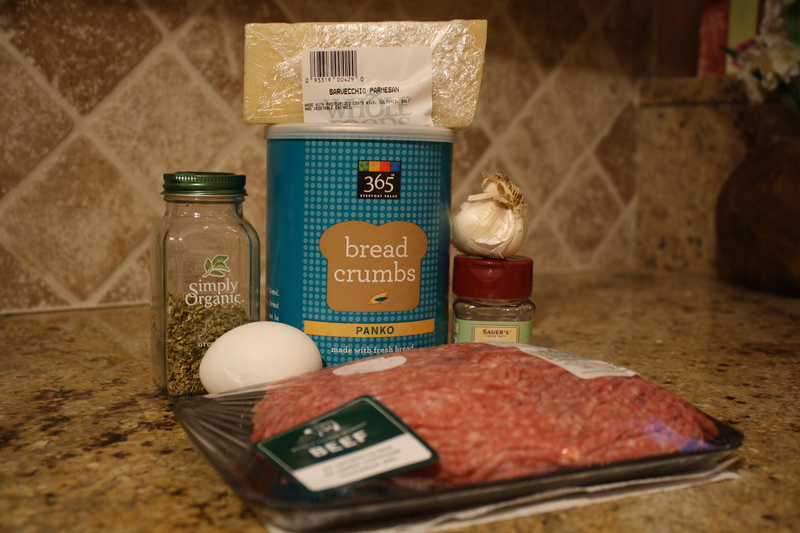 This Whole Foods ground beef is our favorite, has a really really great flavor. Mix it all up and get your hands dirtyyyyyyy! About 1 tablespoon each I would guess. And it makes about 40 U would say? 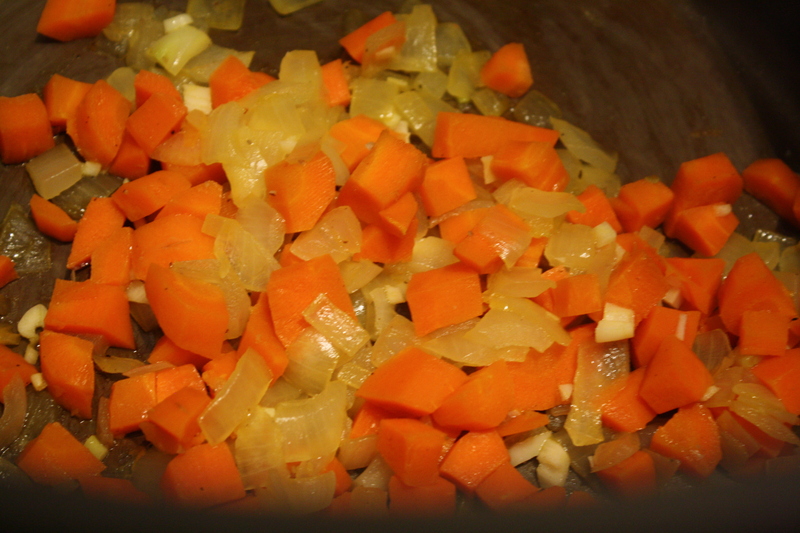 Then saute the carrot and onion in olive oil for a few minutes until they start to get tender. I’d say about 10, adding some chicken broth if they start to stick. 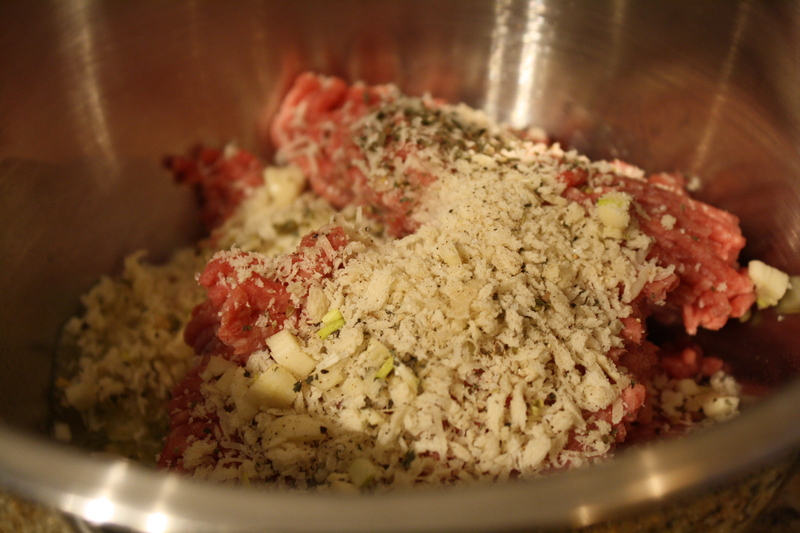 During the last couple minutes add your garlic and basil too. Then in goes the broth, which you’ll want to bring to a boil. 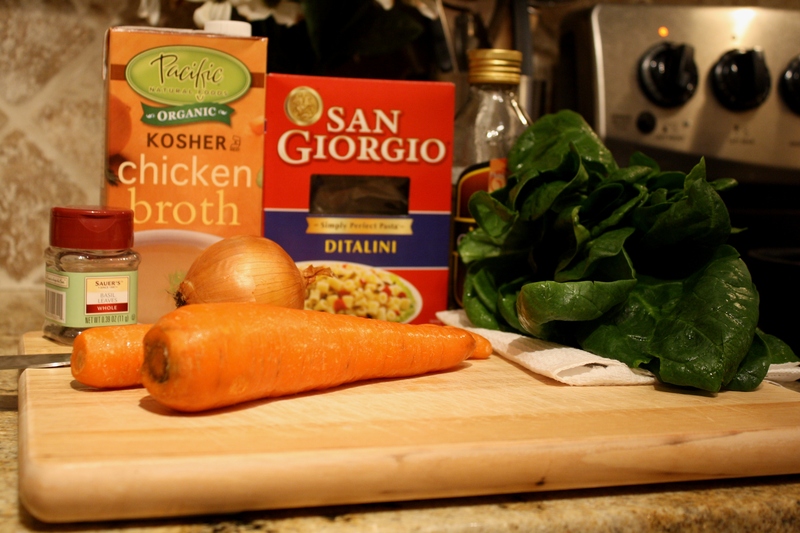 Then add in your pasta and spinach. 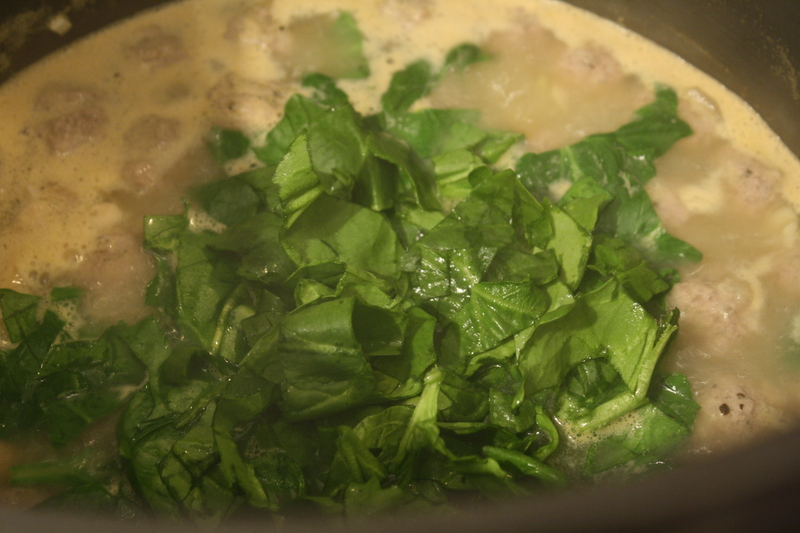 Allow this to boil for about 15 minutes, or until the pasta and meatballs are done that the starch from the pasta has thickened up the soup a bit. 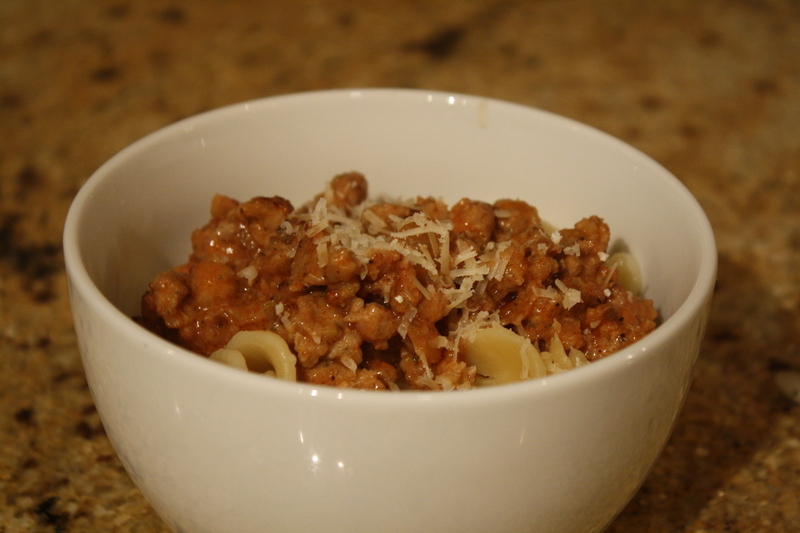 Serve this delicious warm bowl of goodness with some freshly grated Parmesan cheese! 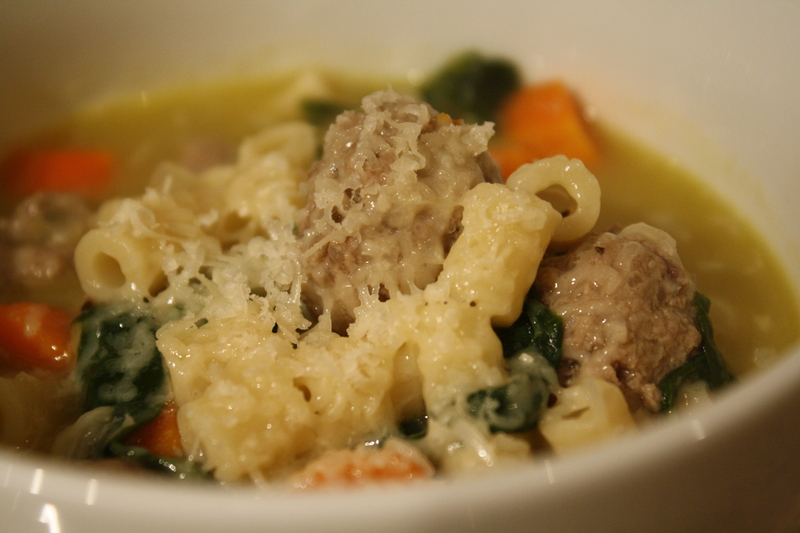 Why have I never had Italian wedding soup before? I was definitely missing out! This bowl of simple yet amazing flavors seriously warmed me inside and out! 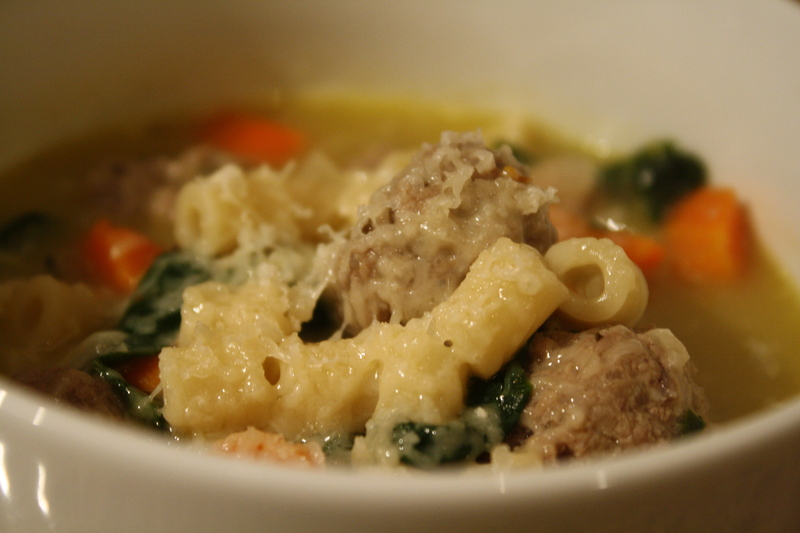 The meatballs had the perfect hint of garlic flavor while the soup was so satisfyingly warm & savory with the chunks of veggies and creamy broth. Like I said, I was a bit apprehensive on how the spinach would go over with this so-called spinach hater (kale, collards, etc. hater) but it was a definite winner. 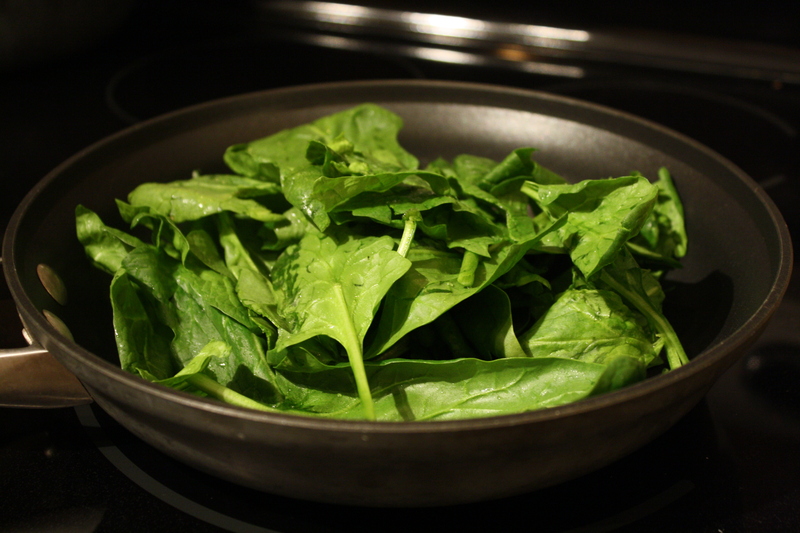 Do you have any special ways/recipes to sneak in cooked leafy greens for a picky veggie eater? Oh the joys of Saturday!!! I’ve been lounging around looking through some recipe books for the upcoming week and watching tv, no complaints here! Speaking of lounging, last night The Man and I decided to get our lounge on at a wine bar just down the street which we really like, The Wine Loft. 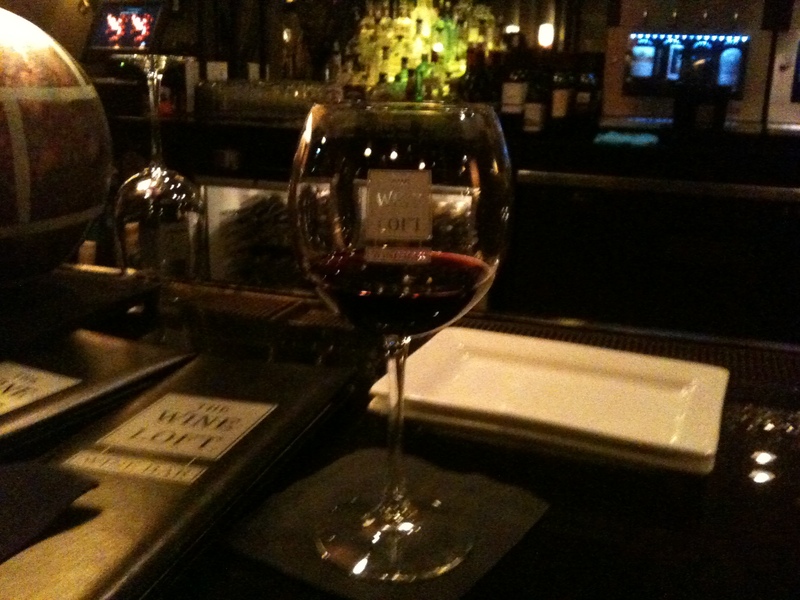 We had some yummy pours as well as a light appetizer before heading home. P.S. My IPhone definitely didn’t take good pics in the darkly lit room! This was a red blend of four different wines and was deelish! The Man enjoyed a local Kluge Cru (Charlottesville, VA) which is actually a Chardonnay that has been blended with brandy and then aged in Jack Daniels barrels, it is AMAZING when served over ice. 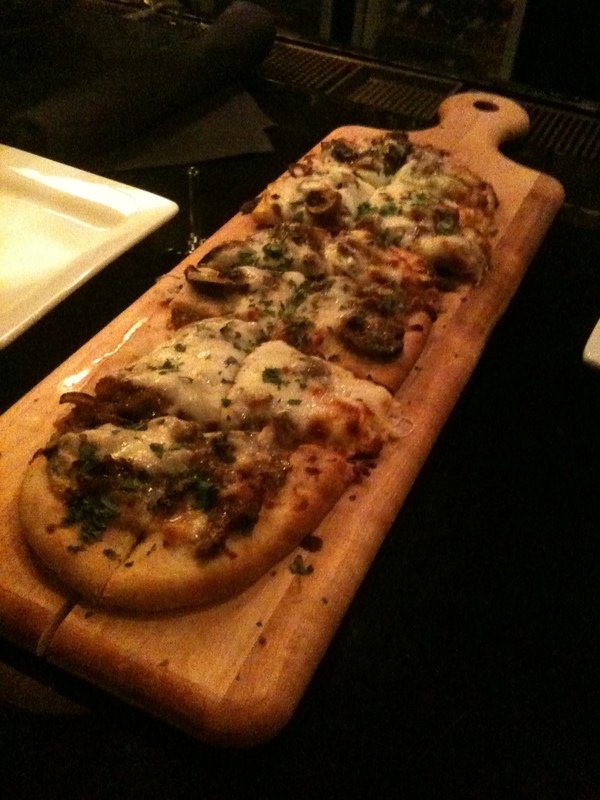 Caramalized onion and mushroom flatbread – holy yum! 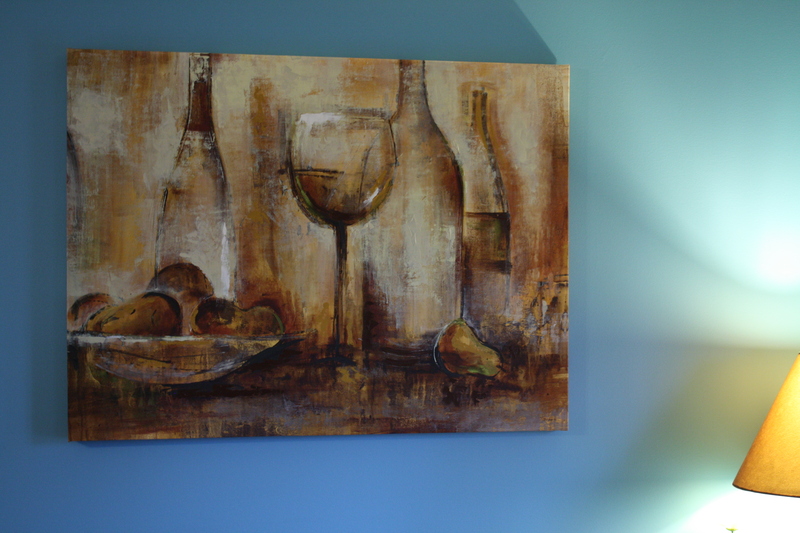 And yes, our walls are blue! Love it. Today I have a few things planned, including getting my hair did, finding a yummy appetizer to make for Super Bowl Sunday and then having Fanatic Mom and Dad over for a belated birthday dinner! Before I go, let’s get into another one of the new Cho flavors, which continue to impress me. The lemon was next on my to-try list and I gobbled it up yesterday afternoon! Kind of reminded me of some sort of lemon pie/dessert, but once again not super sweet and with a little bit of that “pucker” that you’d expect from a lemon. I’d have to say that pineapple is still by all time #1 favorite, but these are some great other flavor options to mix things up! 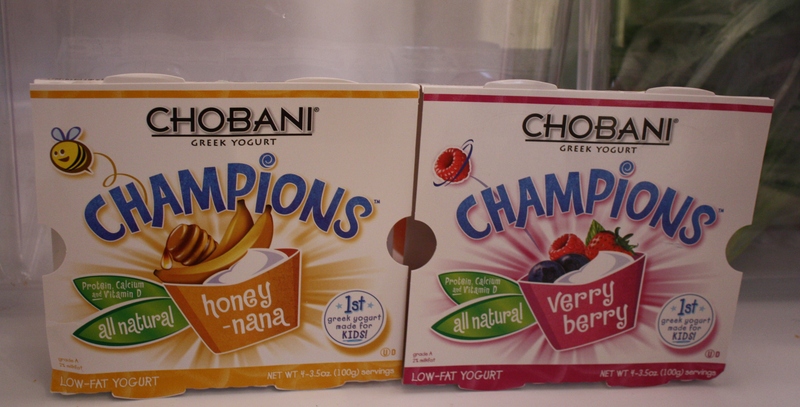 Note that I received all of these Chobani products for free. Oh a late night last night at work it was… but at least it’s Friday now!!! 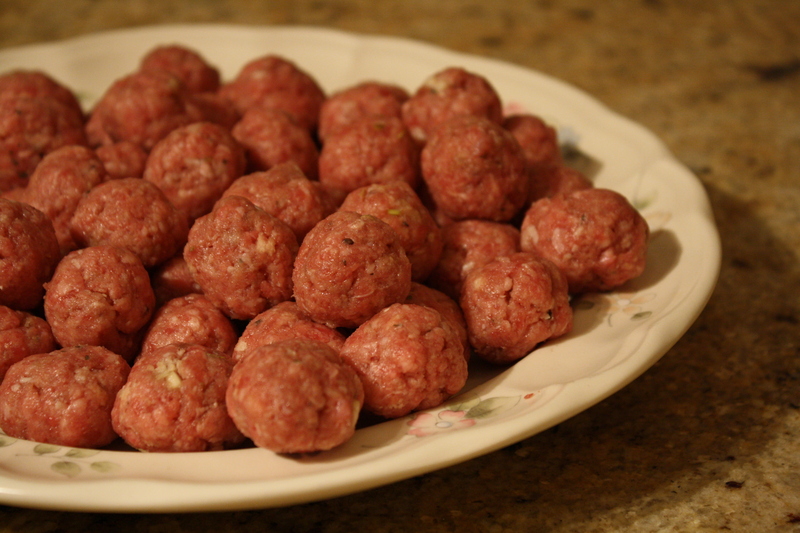 I did, however, have a few ingredients that I knew I wanted to use up in the kitchen so it was time to get creative! 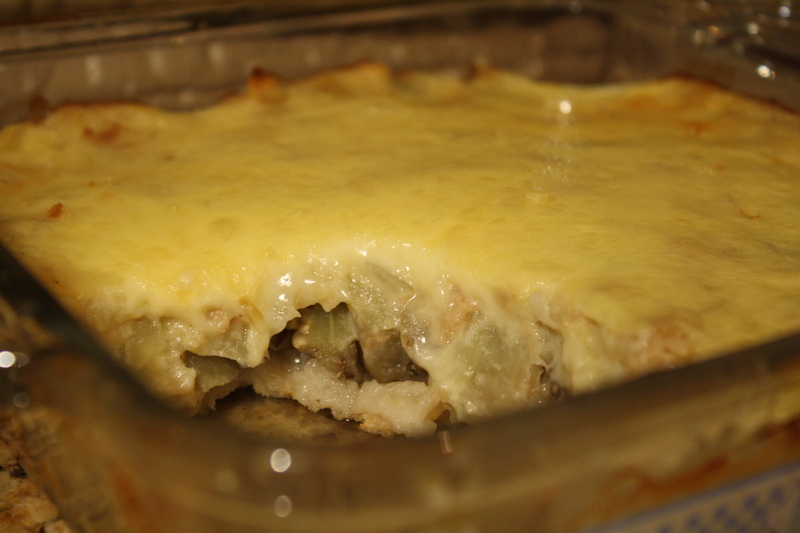 Remember Sunday’s Eggplant Moussaka? Well there happened to be an overabundance of eggplant that needed using ASAP. Ahhh, I remember when I used to be a bit scared petrified? terrified? 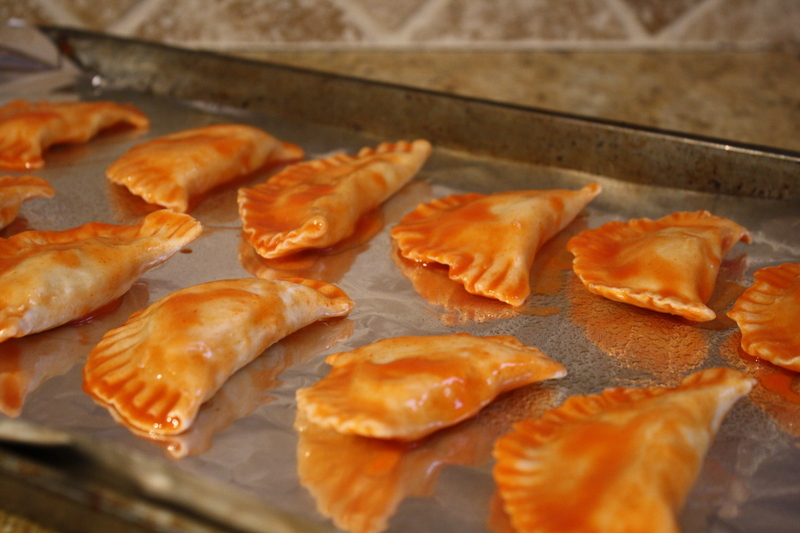 of these lil’ suckers… that was until I made this recipe and my whole was life turned upside down. So here’s the dish I came up with after doing some online research… I’d call it a medley of many recipes all turned into a CookinFanatic style dish! If you’re looking for a deliciously different way to use eggplant, seriously consider trying this ya’ll. I think you’ll be pleasantly surprised at the wonderful combination of flavors. And don’t worry – even though the recipe name uses “buttery”, there is only 2 tblsp in this whole dish and the flavor permeates throughout! 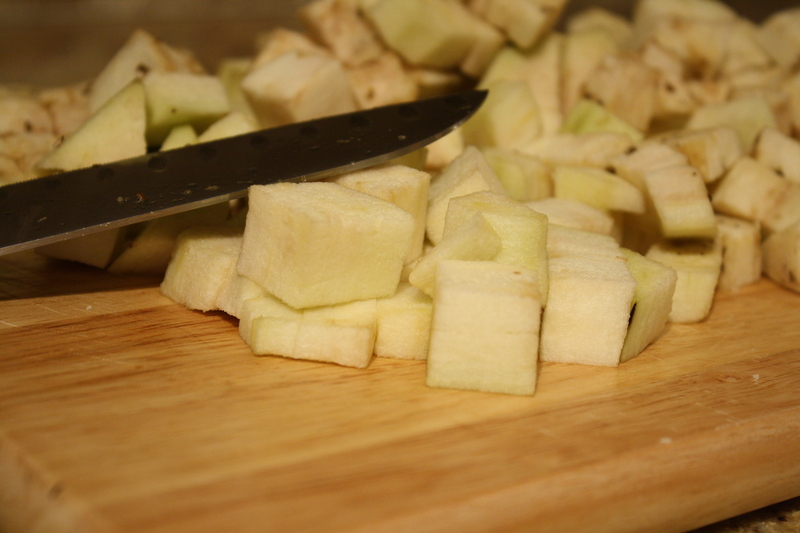 Start with chopping up your eggplant and boiling (in salted water) for about 8 minutes, or until tender. Drain and set aside. 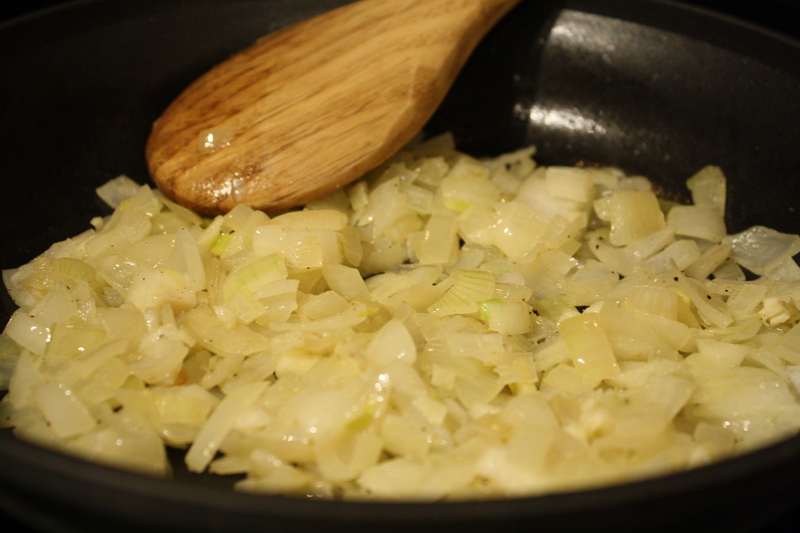 Next saute the onions in 1 tblsp butter for about 7 minutes, or until tender. Add the garlic during the last minute or so. 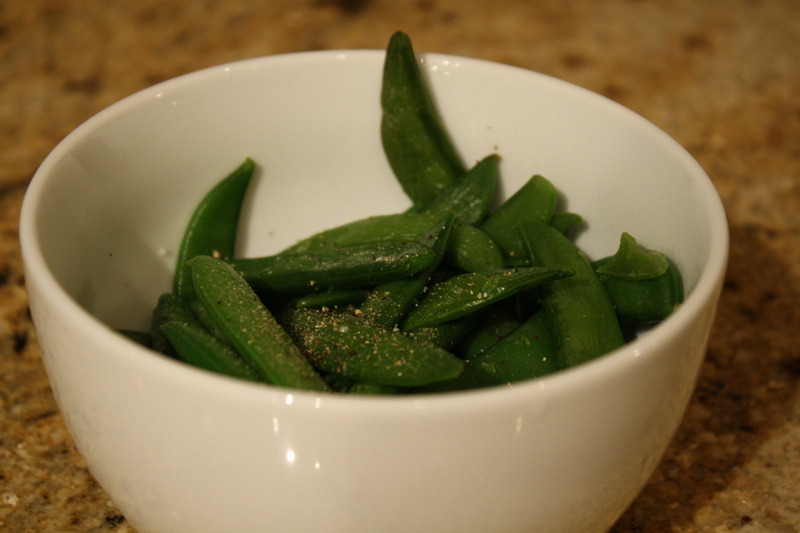 Don’t forget some black pepper too! 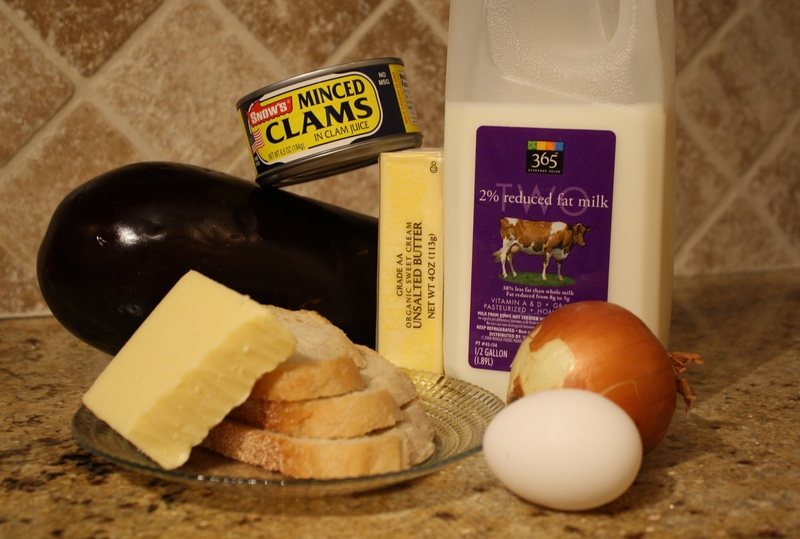 Next in go your partially drained clams plus the other 1 tblsp butter. Cook for another 5 minutes over medium. 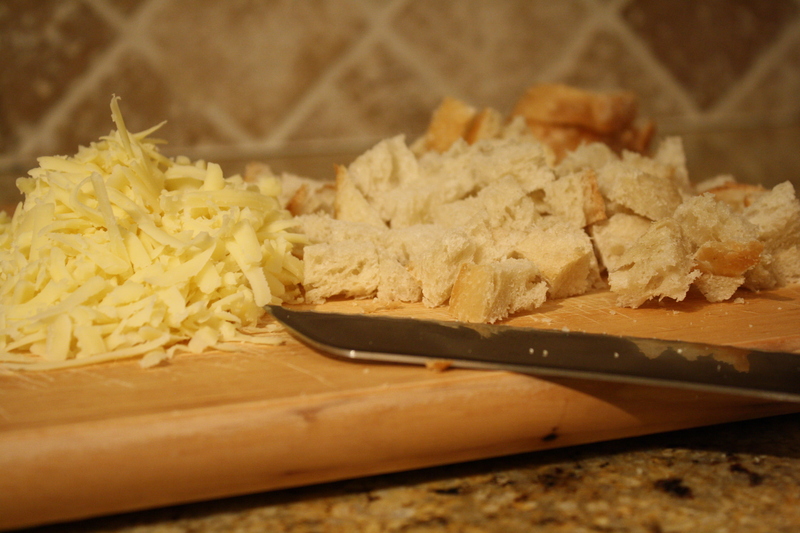 At this point get all the other ingredients ready, including chopping the bread and shredding the cheese. 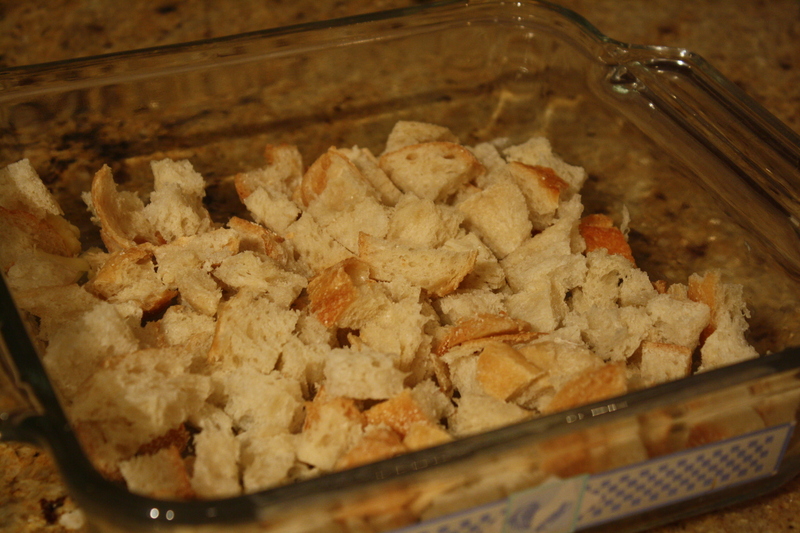 Spread a thin layer of butter in a baking dish (use the stick and rub a thin amount) and layer in the bread cubes. 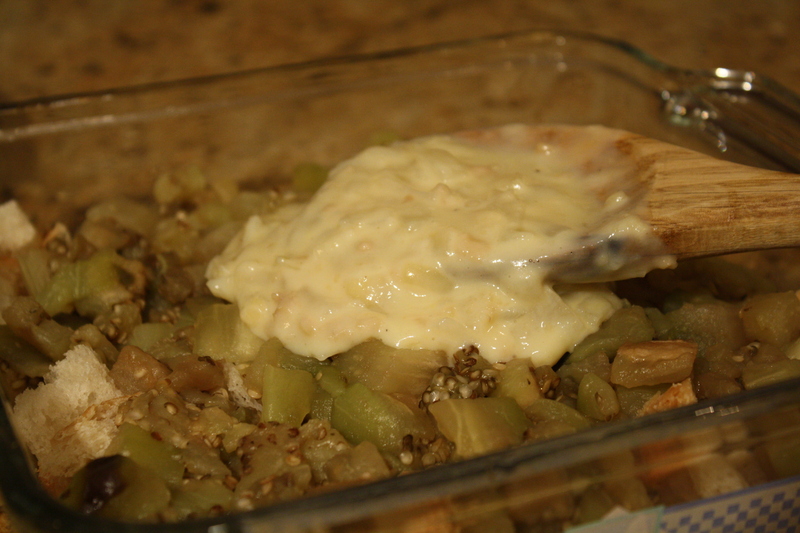 Then add the cooked eggplant on top. 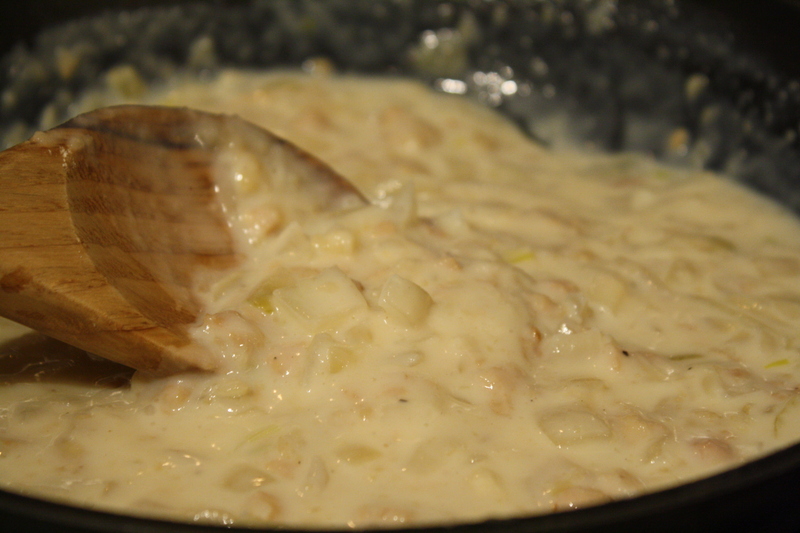 Stir in the flour and let soak into the clam, onion, garlic, butter mixture. 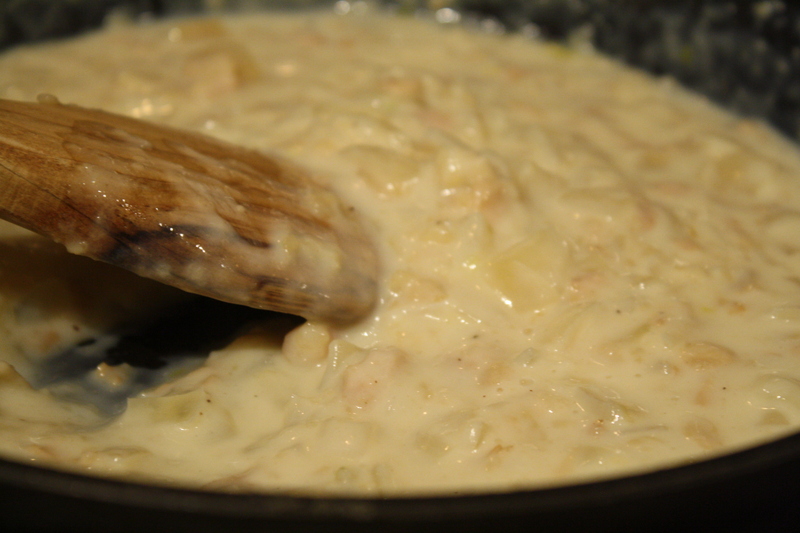 Then stir in the milk until a thick and gorgeous sauce forms. Turn down to medium low if things get too bubbly. Now the luscious clam sauce gets draped over the bread and eggplant layer, partyyyyy time. 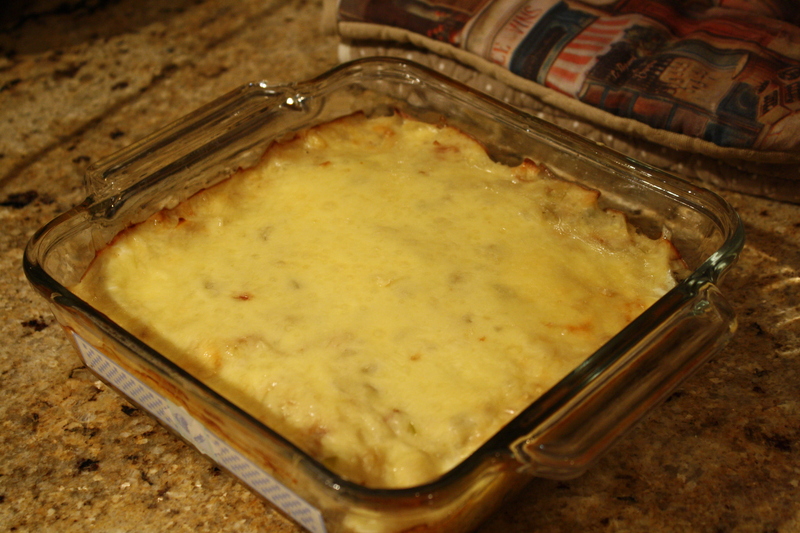 All finished off with a layer of shredded cheese! Let this sit for 5 minutes so that the sauce will soak through to the bread cubes, then place into a 375F oven for 30 minutes or until the edges start to brown and bubble. 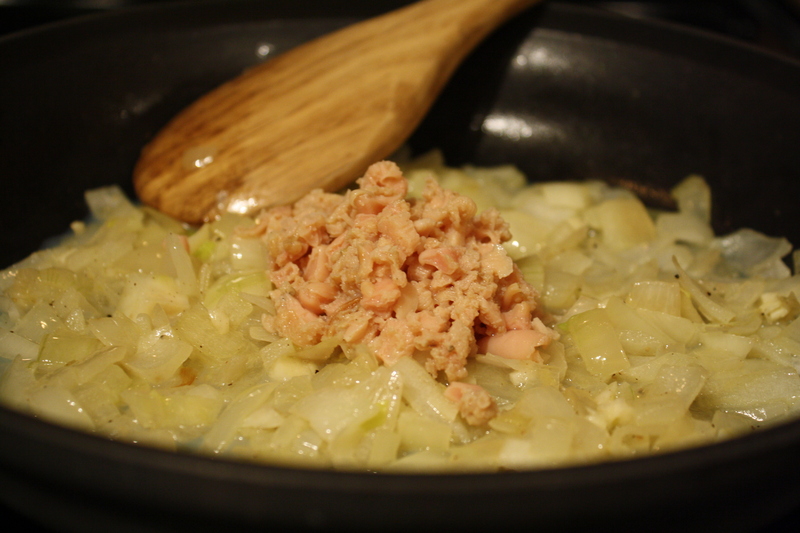 Oh the smell of butter and onions and garlic baking away in your kitchen will just make your mouth water! Or maybe that’s just me? 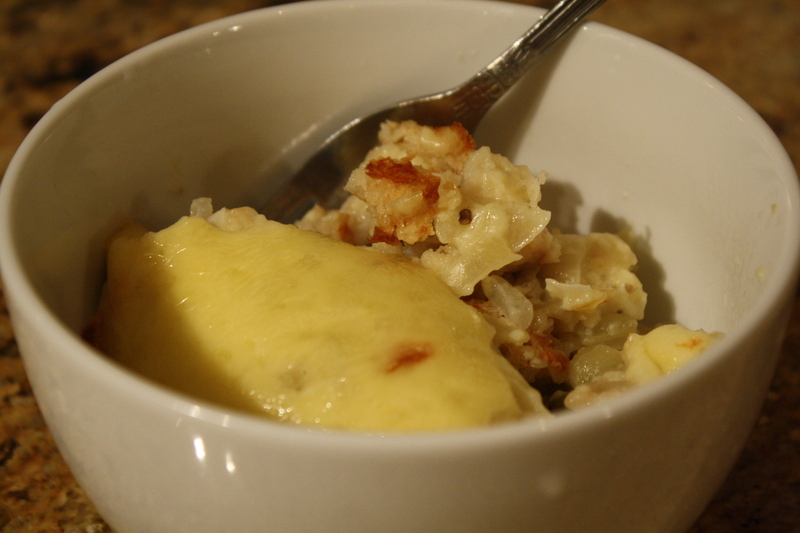 The bread soaks up all of the wonderful clam juice and luscious creamy sauce while also getting a lovely crisp against the buttered baking dish edges… oh this was such a warm and delicious treat! Imagine: the texture of stuffing meets the flavor of these clam stuffed mushrooms then all draped with cheese. I mean, what’s not to like? 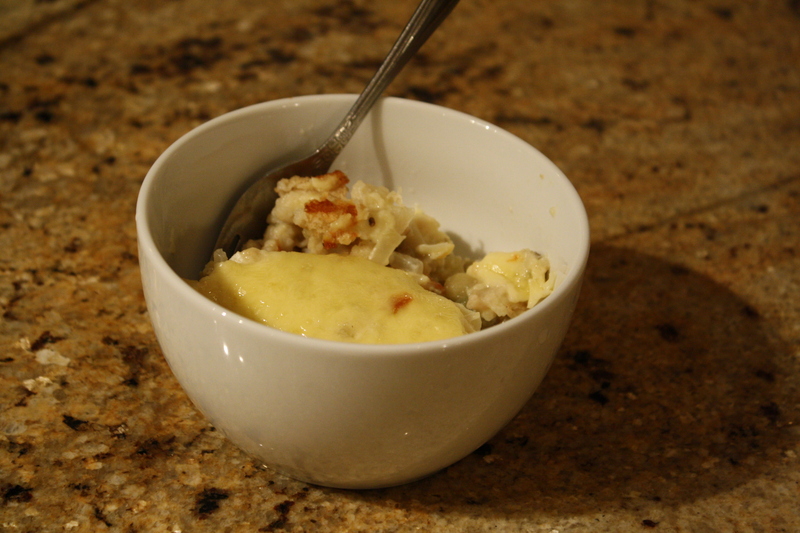 Like I said, expectations on this dish were low… but man oh man, did it excite those tastebuds! 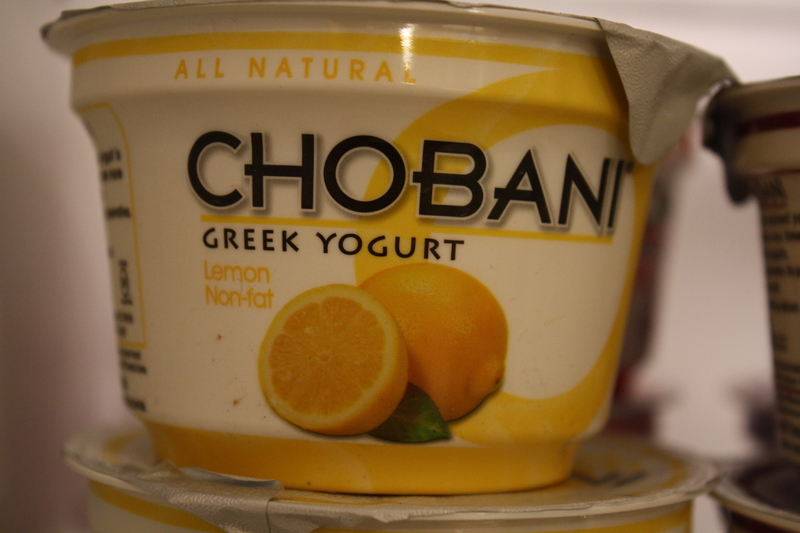 But definitely didn’t make this morning snack of another new Chobani flavor any less exciting! 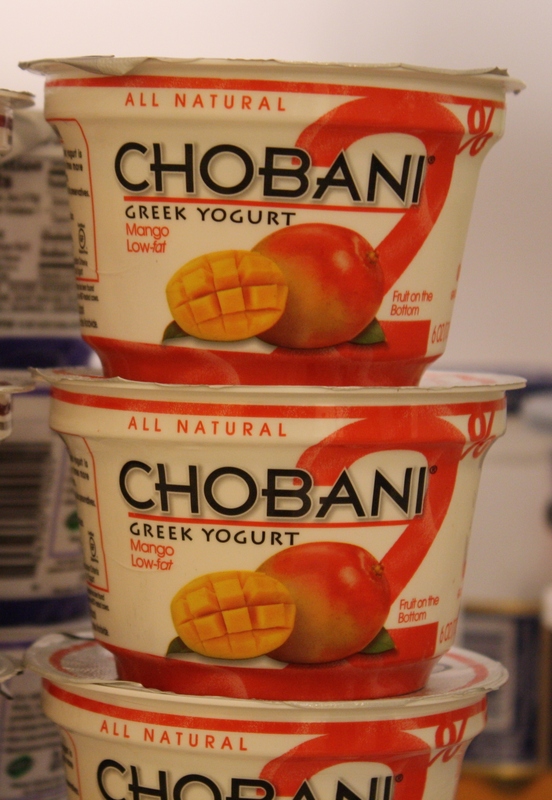 Surprisingly not my favorite fruit ever, but I really enjoyed both the flavor and texture of this new Cho flavor. There were sweet, soft pieces of mango throughout without too much sweetness. Have a question? Want to chat? Feel free to contact me at cookinfanatic@gmail.com !!! Patti on Eeeek, is that a leek?!?! 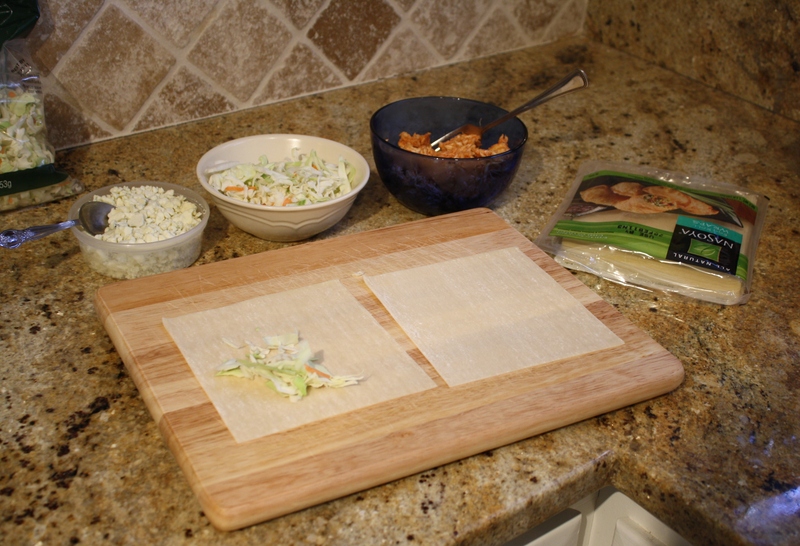 Tamales, Tamales, Ol… on Total Tamale Success!